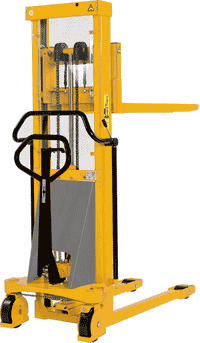 Southworth manual stackers feature a rugged,ergonomic design. They are extremely simple to use, highly maneuverable and available in capacities up to 3,000 lbs. 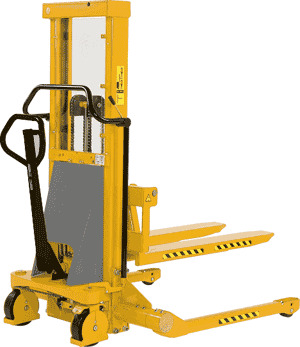 with lifting heights up to 80". Lift is achieved by simply pressing a push button that is integrated into the comfort grip handle. A convenient battery indicator gives charge status at a glance. The integral battery charger makes recharging a breeze. NOTE: Fork Over Models are designed for open bottom skids or containers. They will not work with a standard pallet. Note: Other Fork O.D./Fork Length Available. Consult ZORIN @ (888) 378-6525 for Specifications.